One of the challenges that come with living a vegetarian or vegan lifestyle is finding good sources of protein. Your body relies on protein for strong bones, healthy hair, and overall health. Additionally, people that suffer from gluten intolerance may have trouble finding good alternatives to baking flour. The solution for both of these issues lies with a single item—chickpea flour. Why should chickpea flour be your new gluten-free friend? Because of all the beneficial nutrients that it contains. This gluten-free substance is a healthy alternative to baking flour that is a great source of protein, fiber, and iron. Chickpea flour is an item that you may have never tried before, even though chickpeas were one of the first crops ever cultivated by humans. They are actually the most popular legumes in the world. The chickpeas can be ground into fine powder while still retaining all of the nutrients found in chickpeas. Here are some of the main health benefits of using chickpea flour in your baking. Flour is essentially full of empty calories. It is used in baking to give bread and cakes their substance. Unlike refined flour, chickpea flour is a great source of fiber. One cup of cooked chickpeas contains 12.5 grams of fiber. Ensuring you are giving your body enough fiber can help improve your digestive system, helping you boost your metabolism and prevent obesity. If you are having issues with constipation or gastrointestinal distress, the fiber from the chickpea flour may be a better choice if you must use flour. Since chickpea flour is such a great source of fiber, it is low on the glycemic index. Consuming foods that have a low glycemic index is beneficial for people that have diabetes. It allows you to control your blood sugar levels and avoid spikes in your blood sugar. For those that do not have diabetes, this could help you prevent developing the medical condition. Refined flour can easily raise your blood sugar levels while chickpea flour helps stabilize your levels. Eating nutrient-dense foods is known to help reduce bad cholesterol. Consuming chickpeas can reduce hypertension, protect against heart disease, and balance unhealthy cholesterol levels. All of these benefits lead to improved heart health. Since heart disease is one of the biggest medical concerns that the average adult faces, most people should consider taking advantage of this health benefit provided by chickpeas. Adding chickpeas to your diet can prevent inflammation. 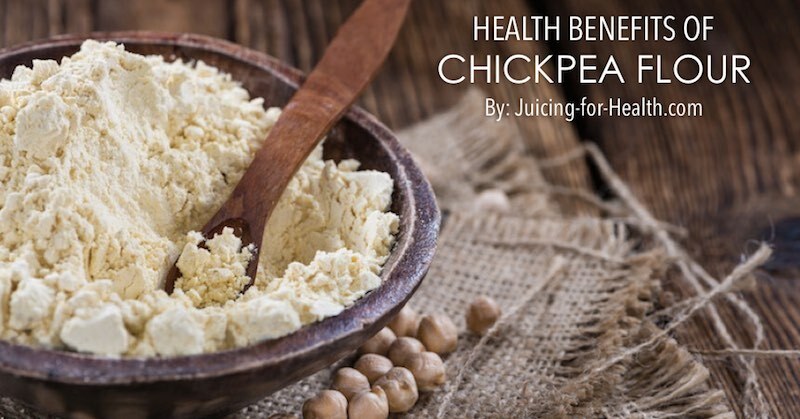 Studies have shown that consuming chickpeas can restore pH level imbalances and fight free radicals. These benefits can directly combat inflammation, reducing the pain experienced from arthritis and minimizing the impact of various skin conditions, such as eczema. While each of the individual benefits mentioned are great on their own, when combined they can lead to an easier time with weight loss. The fiber found in chickpeas can improve digestion and boost your metabolism, while the reduction in bad cholesterol can prevent heart disease and improve your cardiovascular health. If you are serious about weight loss, you may want to start using chickpea flour instead of the regular refined flour. For starters, you will probably want to give up on sweets and baking in general. But if you are finding hard to give a particular baked good, then try replacing the all-purpose flour that the recipe calls for with chickpea flour. The next time you head to the grocery store, instead of grabbing a bag of all-purpose flour, get chickpea flour instead. If you cannot find any at your local grocery store, you may need to take a side trip to your nearest health food store.